ASUS have unveiled their newest zero-noise graphics cooling solution, dubbed SilentCool Technology. &quot;In the past, enhanced video capability also comes with louder noise. With ASUS SilentCool Technology, users can now enjoy high-performance graphics card applications without hearing the noisy cooling fan rotation,&quot; said Kent Chien, Director of ASUS Graphics Business. Silence is golden, but let's look at this design more closely. Eshewing the more traditional Zalman-style front-and-back design pioneered by the ZM80, ASUS' SilentCool is a single-sided solution, albeit with something of a twist, literally. 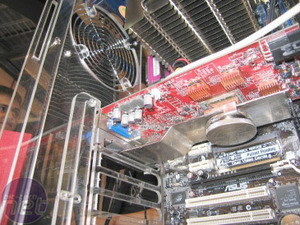 Mounted on the top of the card is a densely finned copper radiator which is fed heat from the GPU via a heatpipe. ASUS have employed a unique joint design, allowing you to rotate the arm 90 degrees to customise your airflow. Unfortunately, the design does no allow for rotation of the radiator itself, losing the convective advantages of face-up position in a tower case. ASUS says SilentCool is &quot;similar to technologies used in processor coolers&quot; - that would be heatpipes then, so nothing new there - and that it &quot;reduces GPU temperatures by 40° C compared with thermal solutions for competing graphics cards.&quot; We don't yet have a sample to test, but a 40 degree drop sounds quite impressive which, if true, makes one worry about the temperatures on these other solutions. If need even greater silent cooling capacity, there is an additional heatpipe / mini-radiator module that pokes out the rear of your case which ASUS claim will lower GPU temperatures by a further 6°C. Clearly not a good idea if you transport your PC to LAN parties every weekend, or need to swap your graphics card out frequently though. The idea of an external heat exchanger is not unique to ASUS. Thermaltake already do it, with their strangely named Schooner passive cooler, but my favourite, for sheer giggle-appeal, is this prototype from Japanese cooling specialists, Scythe. Employing the patented Heatlane technology from TS Heatronics, this monster is actually cooling a Radeon X850XT completely silently. 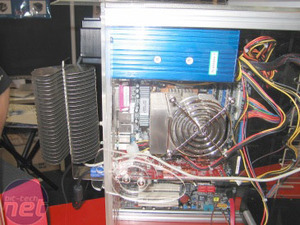 The technology is so effective, I nearly scalded my finger when I saw this system recently at Computex '05 - hardly surprising considering the 70-odd watts of power the GPU kicks out. You can read more about Heatlane's advantages over heatpipes on the TS Heatronics website. Despite the high performance, Scythe told me that production is doubtful due to the high cost of manufacture. Existing zero-noise graphics cards available at retail have been limited to mid-range cards, such as the X700 Powercolor Bravo we reviewed last month. ASUS are launching the SilentCool range with the more powerful 6600GT GPU, the ASUS Extreme N6600GT Silencer, and promise more cards will feature the technology soon. Gamers wanting more grunt will need to wait for future models from ASUS, but there are other options available. GECUBE have the X800 XL 512MB SilenCool that Tim reviewed last week, sporting more than enough power to keep up with a 6800GT; it should put the 6600GT ASUS in the shade. Is anyone else confused by GECUBE's 'SilenCool' versus ASUS's 'SilentCool' ? It would appear that the former launched first, so how ASUS snuck their identical-bar-one-letter variant past the trademark people is anyone's guess. Discuss this story, quietly, in News Discussion. Scythe goes back to basics with it's new fan controller - the Kaze Master. We find out if the sleek and stylish exterior houses an equally impressive product, or if the Kaze Master is all show and no go.